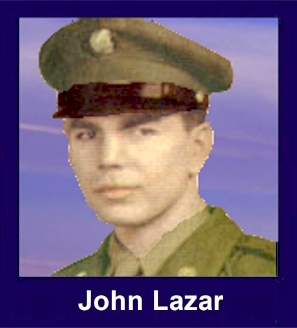 The 35th Infantry Regiment Association salutes our fallen brother, CPL John Lazar, ER57501647, who died in the service of his country on September 7th, 1951 in Hills 717-682, North Korea. The cause of death was listed as KIA. At the time of his death John was 21 years of age. He was from Kewanee, Illinois. John's Military Occupation Specialty was 4745-Light Weapons Infantryman. The decorations earned by CPL John Lazar include: the Combat Infantryman Badge, the Purple Heart, the National Defense Service Medal, the Korean Service Medal, the United Nations Korea Service Medal, and the Republic of Korea War Service Medal. Corporal Lazar was a member of the 35th Infantry Regiment, 25th Infantry Division. He was Killed in Action while on a combat patrol in North Korea on September 7, 1951 by an enemy sniper. Corporal Lazar was awarded the Purple Heart, the Combat Infantryman's Badge, the Korean Service Medal, the United Nations Service Medal, the National Defense Service Medal, the Korean Presidential Unit Citation and the Republic of Korea War Service Medal. John is buried at Kewanee South Pleasant View Cemetery, Lot 1539, Space 4, along with his father (who died earlier) and mother (who died later). (John played minor league baseball for the Chicago Cubs and St Louis Browns before enlisting in August of 1948. He served with Company K in the Army's 25th Infantry Division, 35th Infantry Regiment. Most who served from Kewanee were members of Company K, Kewanee's National Guard unit. The Lazar family not only made the ultimate sacrifice with the loss of a son, all seven of his brothers served in the Army in WWII, Korea, or the post-war period. John also had three sisters. His parents were Ignatz and Martha (Ptashnik) Lazar. They were both Russian immigrants. In a letter to his younger brother Adam, who was playing football at the University of Illinois, John's comrade Elvin Hoffman of Chicago, explained how it happened. "We got up there OK, but that night the Communists were all over the hill. John was always in front of his men. Just then, a Chinese standing about 25 to 30 yards away shot John right in the head. When the boys saw that, why every one just opened fire on that one man. I just made it John's side and all he said was 'Mom', and the next thing I knew John was gone."